George Graham Reviews Robin McKelle's "Mess Around"
With the commercial success of Norah Jones, there has been a flurry of what I call chanteuse style recordings, female vocalists with a jazzy, vaguely romantic style, and who generally eschew the rockier or bluesier influences. That has extended into the straight-ahead jazz world where it seems that almost every other jazz release is by a woman singer. Robin McKelle is originally from Rochester, New York. She began singing in R&B bands at age 15 after hearing her mother who sang in church choruses. In addition to her singing, she took up piano and French horn, and went on to study jazz at the University of Miami in the mid 1990s, and then went on to graduate from the Berklee College of Music in Boston in 1999. She moved to the West Coast and worked as a backing vocalist with such performers as Michael McDonald and Bebe Winans. She returned to Boston where she taught at Berklee, and in 2004 won a prize in the Thelonious Monk jazz competition. She released her first album, Introducing Robin McKelle in 2006, and followed that two years later with Modern Antique both of which hewed toward the big band jazz style. She has developed a following in Europe, especially in France. But she always loved some of the great soul and blues singers like Ray Charles, Etta James and Nina Simone. So given an opportunity to produced the album herself, she gathered some musical friends, along with some luminaries like Fred Wesley, James Brown's trombonist, for some arrangements, and jazz sax great Houston Person for a couple of guest appearances. The backing musicians are mainly jazz players, including pianists Alain Mallet, and Xavier Davis and organist Adam Klipple. Plus bassist Tim Lefevbre and drummer Mark McLean. There are as many as five horn players on some songs, and as mentioned tenor saxophonist Houston Person is featured on two tracks. Also appearing is guitarist Martin Sewell, who has worked with Cassandra Wilson. Ms. McKelle has a distinctive voice that defies easy categorization. She's not a blues-shouter, nor is she the sultry torch singer. But she is versatile and often energetic, and is obviously enjoying the sinking her teeth into this material. Robin McKelle's new CD Mess Around is an interesting and engaging alternative to the abundance of chanteuse style female vocalists. Ms. McKelle, previously known mainly as a jazz singer, turns to soul and classic R&B for influence doing some old songs, original music, and creative reworkings of songs not usually associated with this style. She's a distinctive and appealing vocalist who seems right at home with this material, which she delivers with a combination of enthusiasm and a jazzy cool. The band, comprising mainly jazz players, is first-rate, and the arrangements, many by Ms. McKelle herself, serve to make this CD so engaging. Our grade for sound quality is about an A-minus. Most of the instrumentation was well recorded, and the dynamic range is not too badly damaged by excessive volume compression, but I'm not enthusiastic about the recorded sound of Ms. McKelle's vocals, which sound as if they were treated to emulate a little of the distortion of old analog equipment. The recording and mix engineer is long-time veteran Joe Ferla. 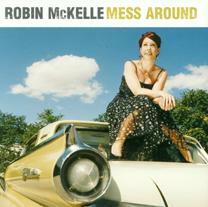 With so many jazzy women singers on the scene, Robin McKelle stands out with her new CD Mess Around.